Has anyone ever experimented with this card? I'm curious to try it in my Yog/ST Sorceror deck, so I can play extra spells. I just wanted to know if anyone had any experience with it, good or bad, before I went to the trouble of play testing it. 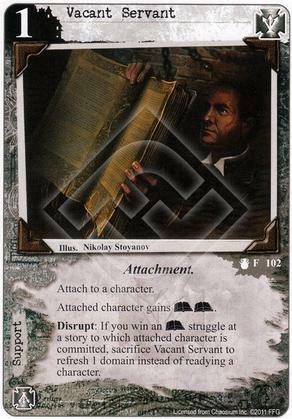 The disrupt effect is feeble, as an attachment it exposes you to card disadvantage if the attached character is removed and frankly ST usually has enough Arcane symbols to get by. I can't imagine it making the cut in any deck I played.